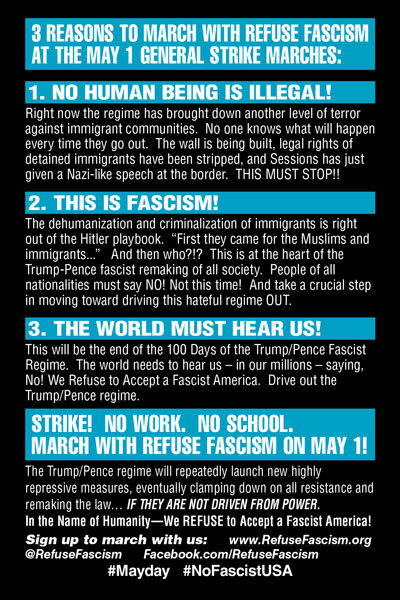 5 Important Protests in 10 Days--March with Refuse Fascism in mass contingents to say: NO! 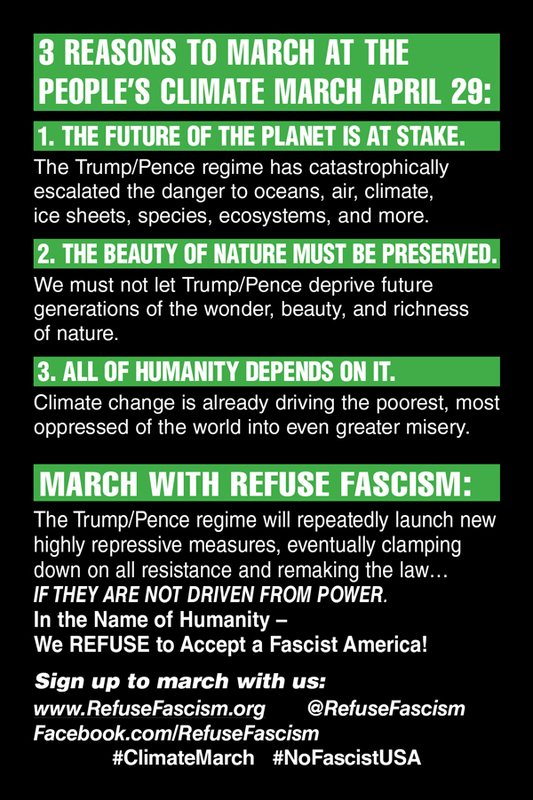 In the Name of Humanity – We REFUSE to Accept a Fascist America! DRIVE OUT THE TRUMP/PENCE REGIME! NO! In the Name of Humanity – We REFUSE to Accept a Fascist America! What Is the Danger that the Trump/Pence Government Poses? Humanity faces an extreme emergency with Trump’s rise to power. 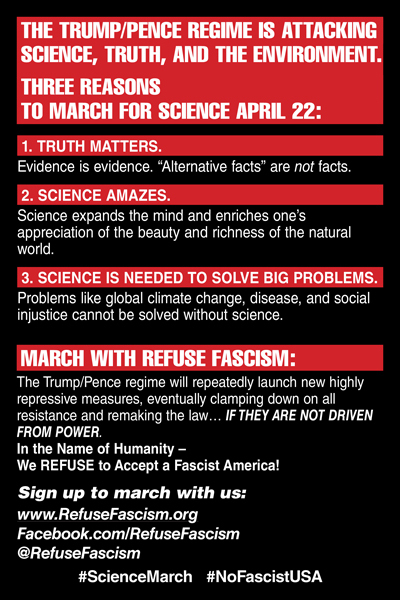 This nationally live-streamed Teach-In aims to deeply explore, from different perspectives, the essential nature of the Trump/Pence Government, the relevance of the history of fascism, the threat it poses to humanity and the planet itself, and the dangers of normalization. Donations requested, not required. This event will be livestreamed at RefuseFascism.org. JOIN the RefuseFascism contingents under the banner of: NO! 10 DAYS from April 22-May 1, the end of the first 100 Days of the Trump/Pence Regime, must be a big leap in organizing the movement to drive this fascist regime from power. The stakes are nothing less than the future of humanity and the planet. Make no mistake. The Trump/Pence Regime—the whole thing—every cabinet post, every executive order, every tweet is a link in the chain of a fascist government and worldview under the signboard of a vengeful “America First” being rammed into place. Every immigrant family ripped apart... every refugee turned back to war torn countries... every pipeline approved...every river despoiled... every denial of proven science, of established facts, of truth itself is killing people now and will cost millions more lives. This is poison to air, water, the earth, and to the conscience of the world. History has shown that fascism must be stopped before it is too late. Fascism is not just a gross combination of horrific reactionary polices. It is a qualitative change in how society is governed. Once consolidated, fascism essentially eliminates democratic rights. This regime will repeatedly launch new highly repressive measures, eventually clamping down on all resistance and remaking the law... IF THEY ARE NOT DRIVEN FROM POWER. People must see the NO! everywhere and learn that there is an organization working for the time when millions act together, filling the streets of cities and towns day after day and night after night, declaring this whole regime illegitimate—Demanding, and not Stopping, Until the Trump/Pence Regime is Driven from Power. Millions must stand together with conviction and courage to resist and say NO! We REFUSE to Accept a Fascist America, not just for ourselves, but in the name of humanity.